Hello, So in the last post we managed to have a new version of integrated with ice-3.6 and we were ready to develop our first js component. 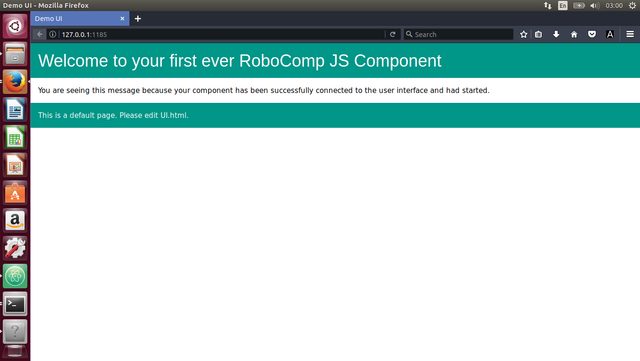 Now today we are going to develop a component that has a UI, and connects to a simple non-js component, here we take CameraV4lComp component for our example. We are going to execute this task by getting a brief understanding of what does a component needs in order to function as required. In the beginning of the program we are creating a node server so that we can serve data to our browser and make an node application, if required. We define two methods displayUI and processRequest which owe to get and post requests respectively and get triggered as required. The displayUI function triggers when a get request is observed and it sends the html file(which we are about to setup) to be displayed or rendered by the browser. The processRequest is a function that gets triggered at a post request and is really useful in implementaions where we are accepting requests from the client(here we are talking about the client of the nodejs server - the user using the browser). Then the program begins with a call to Ice.Promise.try to launch a chain of promises (or futures) that handles the asynchronous nature of Ice invocations with a structure that resembles synchronous code. The function passed to try is executed immediately. The body of this function begins by calling Ice.initialize to initialize the Ice run time. The call to initialize returns an Ice.Communicator reference, which is the main object in the Ice run time. The proxy returned by stringToProxy is of type Ice.ObjectPrx, which is at the root of the inheritance tree for interfaces and classes. But to actually talk to our RGBDBus interface, we need a proxy for a RoboCompRGBDBus.RGBDBus interface, not an Object interface. To do this, we need to do a down-cast by calling RoboCompRGBDBus.RGBDBusPrx.checkedCast. A checked cast sends a message to the server, effectively asking “is this a proxy for a RoboCompRGBDBus.RGBDBus interface?” If so, the call returns a proxy of type RoboCompRGBDBus.RGBDBusPrx; otherwise, if the proxy denotes an interface of some other type, the call returns null. The checkedCast function involves a remote invocation to the server, which means this function has asynchronous semantics and therefore it returns a new promise object. We call then on the promise returned by checkedCast and supply a “success” function, meaning the code that’s executed when checkedCast succeeds. This inner function accepts one argument, bus, representing a proxy to the newly-downcasted object, or null if the remote object doesn’t support the RGBDBus interface. Inside the success function, we now have a live proxy in our address space and can call the server.listen method, passing it the port 1085 (why? because that number is lucky). The function passed to finally is executed after the try block has completed, whether or not it completes successfully. If we created a communicator in the try block, we destroy it here. Doing this is essential in order to correctly finalize the Ice run time: the program must call destroy on any communicator it has created; otherwise, undefined behavior results. The destroy function has asynchronous semantics, so we return its promise to ensure no subsequent code is executed until destroy completes. Lastly, the function passed to catch is the default exception handler for this entire promise chain. Given is the content for our basic UI. Make a html file first as follows. 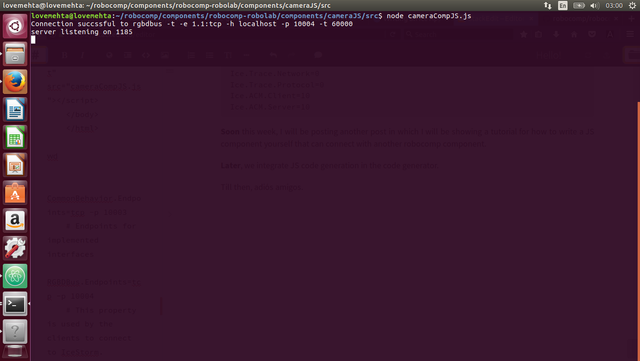 Also, change the config file in the CameraV4lComp/etc folder so that it is according to as feeded in our js component. # This property is used by the clients to connect to IceStorm. Now run the CameraV4l providing the above config file. Now we start our new JS component. But before that we install the node modules required in our component. And then we run the component. Soon this week, I will be posting another post in which I will be adding some functionality to these component which uses the functions provided by the interface. Till then, adiós amigos. Winter is Coming!